Praised as a “fresh and polished soprano”, Elizabeth Polese is an up and coming artist in Canada’s classical music scene. Recent performances have included Rosina in The Barber of Seville at Indian River Festival and Stratford Summer Music, Barbarina in Le Nozze di Figaro with Brott Opera, Fauré’s Requiem and several recital appearances. This season, Elizabeth will complete a fellowship with the Rebanks Family Fellowship and International Performance Residency program with the Glenn Gould School at the Royal Conservatory of Music in Toronto. Visit the Schedule page to learn more about what’s next. 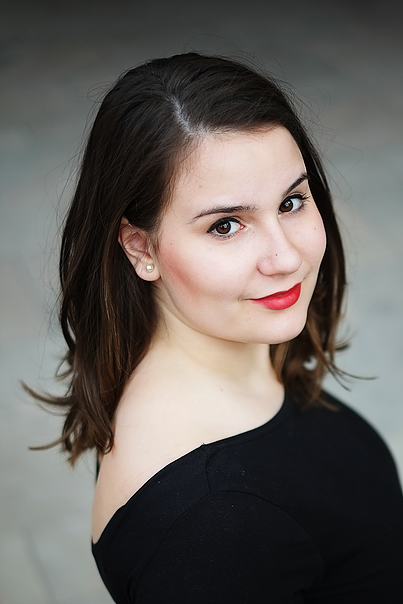 Elizabeth’s 2015⁄16 season included performances as Emily Webb in the Canadian Premiere of Our Town by Ned Rorem in Edmonton, Alberta, as Barbarina in Le Nozze di Figaro at Highlands Opera Studio in Ontario, as one of eight fellows at the Toronto Summer Music Festival Art of Song program, several recital appearances, and oratorio performances in Handel’s Messiah and Faure’s Requiem. An experienced performer and recitalist, Elizabeth has performed an extensive repertoire of art song, and has performed numerous roles in opera and musical theatre such as Barbarina (Le Nozze di Figaro), Emily Webb (Our Town), Papagena (The Magic Flute), Amore and Valletto (L’Incoronazione di Poppea), Remeron (Rob Ford: The Opera), Maria (West Side Story), Ado Annie (Oklahoma! ), Jo March (Little Women: The Musical), Anne Shirley (Anne of Green Gables), and others. She has also appeared in concert with VOCA Chorus of Toronto, the Talisker Players (Toronto), Choral Connection (St. Thomas, ON), Opera 5 (Toronto), the Toronto Mozart Players, gamUT Contemporary Ensemble (University of Toronto), the University of Toronto Symphony Orchestra, the Toronto Community Orchestra, Orpheus Choir of Toronto, and the University of Toronto MacMillan Singers. Elizabeth is an alumna of the University of Toronto, with both Bachelors and Masters degrees in Voice Performance, where she studied under the celebrated Canadian Soprano, Mary Morrison. She is also an alumna of several esteemed training programs for young artists, such as Highlands Opera Studio, Toronto Summer Music Festival, Opera NUOVA, Centre for Opera Studies in Italy, Victoria Conservatory of Music, and the Orford Arts Academy, as well as prestigious youth training programs such as Bravo Academy for the Arts and the Toronto Children’s Chorus. Elizabeth is the recipient of numerous awards and scholarships for her performing endavors. She has most recently been selected as a semi-finalist in the Concorso Internazionale per Cantanti Lirici in Alcamo, Italy, and as a finalist in the 2016 Jeunes Abassadeurs Lyriques competition. Other awards include first prize in the Toronto Mozart Competition, the University of Toronto Concerto Competition, the Greta Kraus Memorial Scholarship, the David and Marcia Beach Summer Study Award, and the Sidney Pulley Graduate Fellowship in Voice.